“Following the Kilmichael Ambush on the 28th November 1920, the commander of the Crown Forces at Macroom Castle Colonel Barton Smith sent a number of auxiliary personnel to investigate the disaster and recover the casualties. 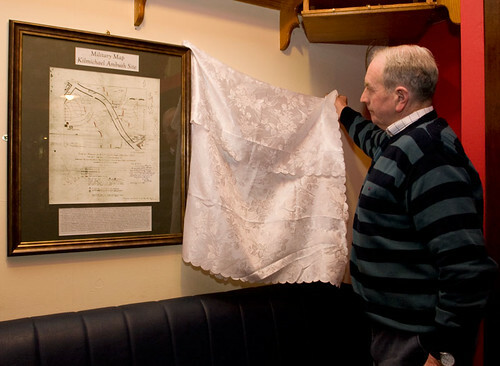 Also included in that group was an engineer named Lieutenant E. Fleming, whose job was to assess and document the ambush site, and chart the facts as they lay before him……” Some 88 years after the historic event in Kilmichael, the nearby village of Coppeen saw the unveiling of an unusual historical artifact. The chairman of CAHCS Colum Cronin opened the proceedings and welcomed everybody. He mentioned the fact that the ‘big story’, and principal facts surrounding momentous historic events such as Kilmichael Ambush and the ambush at Beal na mBláth were all widely known. “So, when something new comes along, a hitherto unknown fact or artifact relating to a momentous event, it is time to sit up and take note”. “We have”, Colum continued, “one such artifact to reveal to you here this evening”. The inestimable value of this item in its frail condition, dictated that the original could not be put on public display. He went on to state that the document in question had been copied and that hours of careful restoration went into retaining all the original data, including some handwritten notes from various figures including Tom Barry. Colum went on to explain that the person responsible for the acquisition of this item was eminent author and historian Sean Crowley of Gurranes Templemartin, who was the inevitable choice for the unveiling. Sean explained how the document came into his possession and spoke briefly about Tom Barry and connection between Coppeen and the ambush. “Barry had an extensive network of support personnel strategically placed all over the area, each having important roles in the operation, particularly during the aftermath of the event”, said Sean, to an attentive audience. 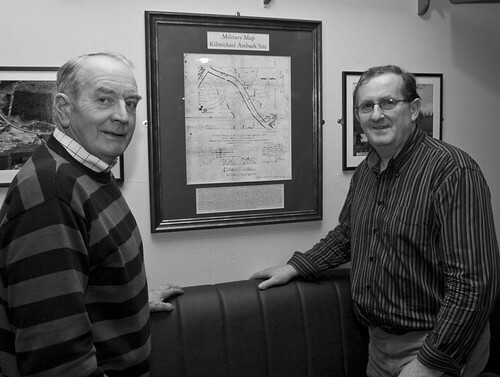 He paid particular thanks to the O’Mahony family of Ballymichael from whom he received the map. He stated that in his judgment, the Coppeen Archaeological Historical and Cultural Society was the most appropriate body to be the custodian of this important item, and he was very pleased to see it on permanent display in An Caipín for all to appreciate. Following the official unveiling the Kilmichael Military Map, Colum sang out the evening with his rendition of “The Boys of Kilmichael” accompanied by a wonderful chorus from the assembled crowd. A collection of local photographs was also unveiled on the night, now on permanent display along with the map in An Caipín. Following the Kilmichael Ambush on the 28th November 1920, the commander of the Crown Forces at Macroom Castle Colonel Barton Smith sent a number of auxiliary personnel to investigate the disaster and recover the casualties. Also included in that group was an engineer named Lieuenant E. Fleming, whose job was to assess and document the ambush site, and chart the facts as they lay before him. Following his surveillance of the site, this is the map which Fleming produced. Notably Fleming was able, with some accuracy to work out the number of volunteers in each section from the imprints and impressions left on the soil and vegetation. He also ascertained with equal accuracy the positions of the fallen auxiliaries. One of the auxiliaries – Lieutenant Cadet H.F. Forde was found to be alive though seriously wounded when the bodies were retrieved the following day, and he was taken to Macroom for medical treatment and subsequently to England where it is believed he lived into the 1980s. Lieutenant Forde’s family made a claim for compensation as it appears that he was seriously disabled due to his injuries. During this claim process, this document was used by the Forde family solicitors to substantiate their case. They were successful in receiving a sum of £10,000. This document was held by a law firm in Macroom until the 1960s when it was given to the O’Mahony family of Ballymichael. 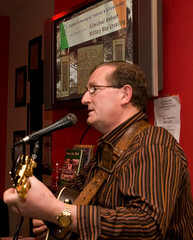 Tom Barry was a personal friend of the O’Mahonys, and was a regular visitor to Ballymichael. This document was the subject of discussion on a number of such occasions, and Tom Barry wrote several comments in pencil relating to aspects of the ambush (on the right-hand side and top right-hand corner). He also wrote a note to Fr Donal O’Mahony (which is in blue biro) and he notes (also in blue) certain names of ambush participants. This document passed on from Fr. Donal (RIP) to his brother Edward O’Mahony, who passed it to Sean Crowley Templemartin. Sean then presented it to Coppeen Archaeological Historical and Cultural Society (CAHCS) who, with acknowledgement of the importance of this valuable record of our local heritage, and appreciation to all those aforementioned, painstakingly copied and restored it, and are proud to facilitate its display for all to study and appreciate.